Yanmar was founded in Osaka in 1912 by Magokichi Yamaoka, a student of Rudolf Diesel, inventor of the diesel internal combustion engine. In 1930, Yanmar produced its first diesel engine (with an output of 5hp). 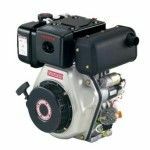 Power Equipment Australia was incorporated on October 1st 1990, and is the exclusive authorised Australian, New Zealand, PNG and South Pacific Distributor of Yanmar Marine and Industrial diesel engines importing product from Yanmar plants all around the world. Since the mid 1990’s, Yanmar has consistently been by volume, the top-selling brand of diesel engine sold in Australia, irrespective of size or application. The Yanmar brand is a dominant force in marine, industrial, rural, power generation, pumping and earth moving applications.